6 Simple Garden Tools - The Only Tools Needed For An Amazing Garden! All it takes is a few simple garden tools to have an amazing, weed free, and highly productive garden. In fact, as we see it, 6 just about does the trick just perfectly! It doesn’t take a lot of expensive tools to create and maintain a Raised Row Garden! The fact is, with a Raised Row Garden, you don’t need a lot of tools to create a lot of produce. No rototiller, no tractor with plow, and no specialized digging tools. In reality, you really only need about 6 simple garden tools to create the garden of your dreams. In a Raised Row Garden, the post hole digger is the planting tool of choice. It creates a perfect 4″ wide hole that is 6 to 8″ deep. And it does so in seconds, and with little effort. Post hole diggers are incredible in the garden! 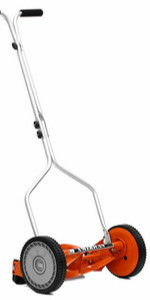 A good metal tine garden rake is perfect for planting the coveted cover crop for a Raised Row Garden. Each fall, we pull back the straw mulch in our growing rows and scratch the surface of the soil with a garden rake. Once we spread our Annual Rye cover crop seed, we rake lightly again to set the seed, and our fall gardening chores are complete! Cover crops replace 90% of the work in a traditional garden, and a good metal rake makes easy work of the planting process. For pruning and harvesting, one great pair of sharp, ratcheting pruners is a must. 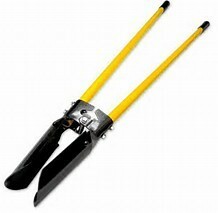 A good pair of pruners make life easy in the garden. They are perfect for pruning back and up under tomatoes and peppers. They are also wonderful for cutting off and harvesting cucumbers, zucchini, watermelon and more. It is much better for your plants to cut these crops instead of pulling them from the vines. 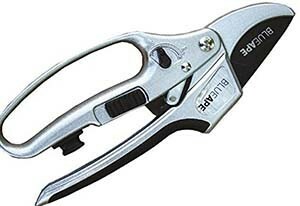 Ratchet Pruners make pruning, cutting and harvesting a snap! If you have a Raised Row Garden, you need a compost bin. If you have a compost bin, you need a good pitchfork! Pitchforks are a must for turning compost piles easily. They also come in handy for harvesting root crops like garlic, potatoes, sweet potatoes and more. One way or another, you will need a device to cut back your cover crops in the spring. We have used our bagging lawn mower for years with great success. But you could also a string-trimmer, or even a pair of shears. So what place does a hand or lawn edger have in a garden? It turns out they are perfect for creating planting rows for seedlings. We use ours to quickly slice a perfectly straight row for planting green beans, peas, corn and other seeds. We can create our planting rows in our 20′ long rows in under a minute. 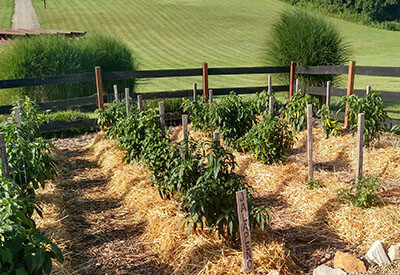 There you have it – our list of 6 simple garden tools that can create and maintain a Raised Row Garden! Of course there are many other tools that can perform some of the above tasks, but believe it or not, you could easily get by with just those 6. Happy Gardening! – Jim and Mary. To receive our 3 Home, Garden, Recipe and Simple Life articles each week, sign up below for our free email list. You can also follow us on Facebook, Twitter, Pinterest, or Instagram. This article may contain affiliate links. ← How To Build A DIY Pergola – Create An Amazing Outdoor Living Area!